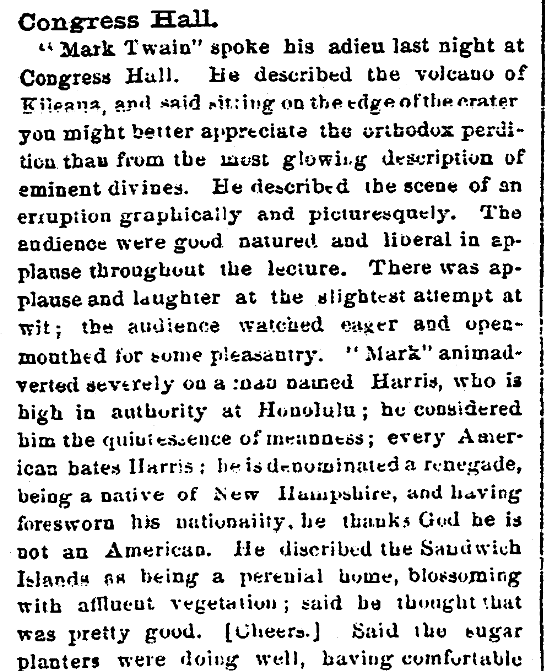 Introduction: In this article, Mary Harrell-Sesniak searches old newspapers to find quotes from one of America’s favorite writers: Mark Twain. Mary is a genealogist, author and editor with a strong technology background. If you are interested in quoting someone, all you have to do is a Google search. Numerous websites have accumulated sayings on a wide variety of subjects, all for the taking with just a simple cut and paste. But is that all there is to it? Of course not. In virtually 100% of the cases, you’re missing the how, the where and the important why those words of wisdom (or witticism) were said. So, why don’t you follow the spirit of one of my research mottoes (“A Quote Is Just a Quote When Taken Out of Context”) and go find the background of those quotes in old newspapers. Chances are, if the quote is famous enough, it’ll be in the newspapers – and chances are, you’ll find a few misquotes by modern so-called historians. Take for example these quotable quotes by that great American humorist Samuel Langhorne Clemens (1835-1910), who published under the “nom de plume” (French for “pen name”) Mark Twain. Photo: Mark Twain, by Mathew Brady, 7 February 1871. Credit: Library of Congress, Prints and Photographs Division. Twain has been quoted as mentioning that humor wakens people to a new life, but where did this quote come from? 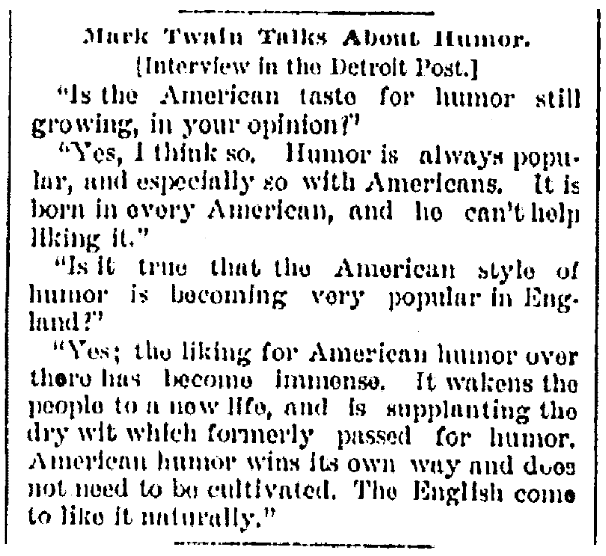 It came from a query during an 1885 interview about American taste for humor. I think I’m going to save these Twainisms for the next time I celebrate someone’s birthday. They’re absolutely hilarious. Why Did Clemens Choose the Pen Name “Mark Twain”? If you Google “Mark Twain,” various commonly posed questions arise, including the one of why the nickname was chosen. I wasn’t able to find an article describing his pen name in his own words, but all the online articles agree on his love of riverboats. Clemens was once a riverboat pilot on the Mississippi River. The most commonly cited reason for his pen name is related to riverboats: when they were in fear of going aground, riverboats used a sounding line marked at intervals of a fathom (six feet) to measure the depth. 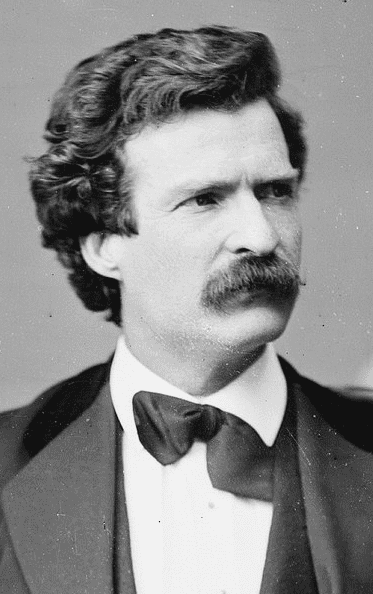 “Twain” is an old term for “two,” so when the people measuring cried out “mark twain,” they were indicating there were two fathoms, or 12 feet, of water under the boat – a safe enough depth for the boat to continue. Before Clemens adopted this riverboat phrase for literary purposes, you can find references that put this term into context. I was unable to find a direct quote on why Clemens chose this phrase for his pen name, but my theory is that he found humor in a term that kept boats from hitting rock bottom – perhaps a sly, self-deprecating reference to his own writing. 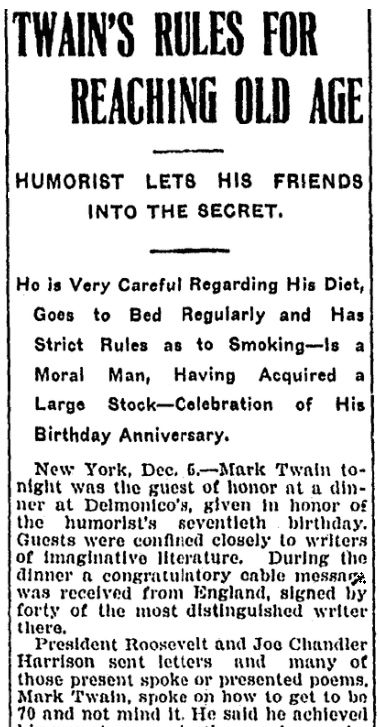 To enrich your summer experience, here’s a research challenge: search old newspapers to find more quotes by Mark Twain. The ones I’ve chosen for this blog article are just the tip of the iceberg compared to what is still out there! You might also find it fun to look for book announcements and the first mention of famous characters such as Huckleberry Finn or Tom Sawyer. Please leave me a comment if you find any previously unknown Samuel Clemens quotes!